You should not leave your puppy alone with older dogs until it is four months old. Until they are four months old, puppies do not properly display submissiveness. In addition, they want to play! So they can end up pestering and annoying older dogs. 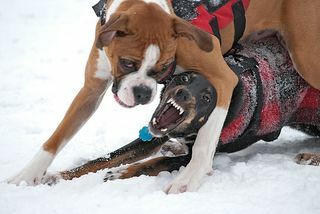 Most older dogs will respond by growling or snapping at the puppy but they may also bite the puppy. ← Should I get two puppies? I’ve been correcting my dachshund/jack Russell terrier mix puppy (3 months old) with my full blood dachshund when she gets too rough when playing. She makes this loud growling sound a lot when playing so sometimes it’s hard to tell if I should correct that or not.